Partner Jio Preview Offer is an exclusive preview of Jio 4G services. 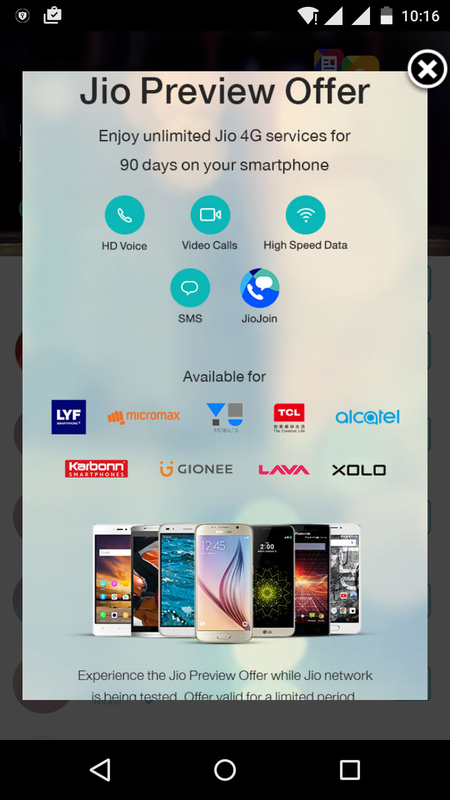 As a part of the Offer, you will get unlimited HD Voice & Video calling, unlimited SMS, unlimited High-Speed Data and a host of Jio Premium apps like JioPlay, JioOnDemand, JioBeats, JioMags, JioXpressNews, JioDrive JioSecurity and JioMoney. These benefits are valid for a period of 90 days from the activation of the Jio SIM on select Samsung, Micromax, Karbonn, Lava, Xolo, LG, Gionee, Panasonic, ASUS, Yu, TCL, Alcatel handsets. You can select between a Prepaid & Postpaid SIM as per your requirement.